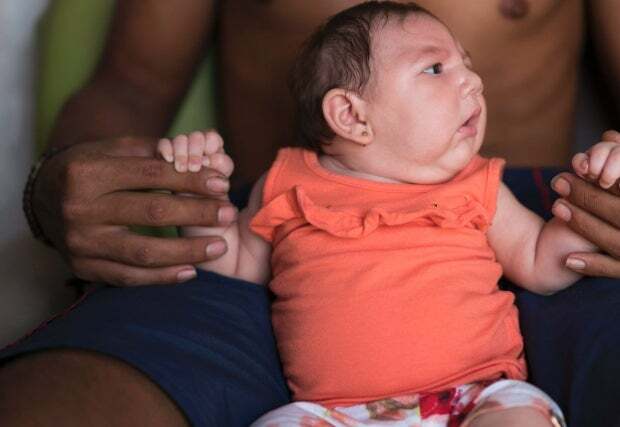 Researchers at the Centers for Disease Control and Prevention (CDC) are raising the alarm about a potential link between a mosquito-borne virus called Zika and a dramatic increase in Brazilian babies born with microcephaly — a rare condition that results in abnormally small heads. Since October 2015, 3,530 babies have been born with microcephaly in Brazil. During the prior year, the number totalled fewer than 150. That’s a 10-fold increase. To date, nearly 40 microcephaly-related deaths have been identified. The country is now having to deal with a growing number of children with severe developmental disorders. Microcephaly in babies can be caused by a number of things, including infections in the mother, genetic abnormalities, and exposure to toxins. The CDC has now uncovered evidence (PDF) of a dengue-like virus called Zika in the placentas of two women who miscarried their babies and in the brains of two newborns who died from complications arising from microcephaly. It’s not definitive proof that Zika is causing the birth defects, but it’s certainly bolstering the case. The mere presence of Zika in brain tissue is “very significant,” as a CDC official put it in a Globe & Mail article. The situation remains mysterious. Some babies with microcephaly tested negative during the analysis. What’s more, only a small fraction of pregnant women with Zika symptoms have given birth to babies with microcephaly. Also, Brazil is currently having to contend with two related viruses, dengue and chikungunya, so it’s proving difficult for epidemiologists to isolate causal factors. CDC recommends that all people, especially pregnant women, who are traveling to Brazil and other areas in Latin America, should take precautions to avoid mosquito bites to reduce their risk of infection with Zika virus and other mosquito-borne viruses such as dengue and chikungunya. The Zika virus is currently at pandemic levels in South America, Central America, and the Caribbean. To date, there are no reports of Zika being locally transmitted in the United States, but cases have been documented in returning travellers. Because the disease rides on the back of the dreaded A. aegypti mosquito, it’s feared that parts of the United States could soon be at risk. This is not a new disease, however. Epidemiologists have known about the Zika virus since it was first discovered in Uganda in 1947. At first a small problem, it has quickly erupted into a serious global health issue. Symptoms typically include fever, muscle aches, eye pain, and a rash. But in the six decades that Zika has been studied, the virus has not been shown to cause hemorrhagic fever or death (unlike dengue). Now, with the potential link to microcephaly, and the virus’s spread to virtually all tropical parts of the world, it’s becoming a major problem. There are no Zika vaccines in advanced development, but it’s possible that some existing vaccine platforms could be adapted. That being said, the New England Journal of Medicine says that even if a vaccine were available, the sporadic and unpredictable nature of epidemics make pre-emptive vaccination of populations “prohibitively expensive and not cost-effective”. Deploying stockpiled vaccines tends to be slow, while advanced anti-mosquito measures, such as gene drives, are still a way off. In the meantime, the NEJM recommends house screens, air-conditioning, and the elimination of mosquito-breeding sites, such as household waste containers — though these are “luxuries often unavailable to impoverished residents of crowded urban locales where such epidemics hit hardest”.